Cabbage is considered the most ancient of cultural vegetable plants. Now about 100 of its types are known, many of which include a large number of grades. The most known and traditional is the look a white cabbage. White cabbage Biannual plant. In the first year cabbage forms a head of cabbage, on the second — цветонос (seeds). Has valuable food and medicinal properties. The red cabbage actually is one of kinds of a white cabbage. • Requirements to the soil Prefers the lands rich with humus with neutral reaction. Well grows in lowlands. • Requirements to humidity Vlagolyubiva, at a lack of water a harvest strongly decreases, however does not transfer long remoistening. • Requirements to light Typical long-day plant. It is photophilous. 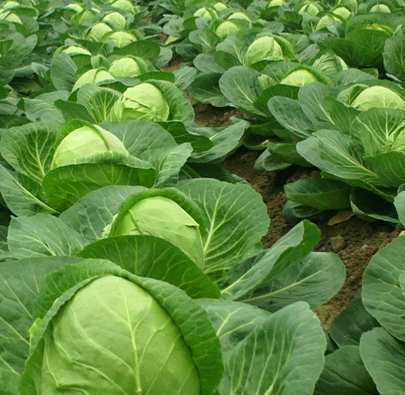 • Cultivation temperatures can damage One of the most frost-resistant plants, cold only during crops therefore cabbage is usually grown up in the rassadny way. The tempered seedling, depending on a grade, can maintain cold snaps to -8 °C. Are optimum for growth and development of temperature of 15 — 17 °C. The majority of grades, except removed especially for the southern regions, badly transfer temperature over 25 °C — their productivity from a heat sharply decreases. • Geographical restrictions at cultivation on zones and regions For culture in general are almost not limited, a white cabbage — one of the few types which can be cultivated successfully even in a tundra zone. In view of duration of the vegetative period in many regions cabbage is grown up in the rassadny way. Seedling contains in a warm hotbed, the greenhouse or in rooms. All grades of cabbage are divided on maturing term into early, average and late, also sredneranny sometimes allocate. Some nuances of cultivation of this or that cabbage also depend on it. Grades for many areas. (adapted for a wide range of climatic conditions) Moscow late 15. For a midland and more northern areas, including. St. Petersburg, Novgorod. Late-ripening grade. From full shoots till a harvest of 105 — 130 days. It is considered the best grade for fermentation. Number first of gribovskiya 147. It is recommended for all zones of Non-Black Earth Region, but successfully grows as in more southern areas (in them ripens approximately a month earlier), and in more northern (ripens slightly later, it is frequent with a smaller weight). Early grade. From emergence of full shoots before receiving a harvest on average there pass 79 — 120 days. Glory of 1305. For the Nonchernozem zone and more southern, droughty areas. Mid-season grade. From full shoots till a harvest of 101 — 132 days. It is steady against a mucous bacteriosis. The Kharkiv winter. Late-ripening grade. From full shoots till a harvest 152 days. Universal use. Grades for the central regions. Belorusskaya 455. For Non-Black Earth Region. Mid-season grade. From full shoots till a harvest of 105 — 130 days. It is steady to Kiel. June. For the Nonchernozem zone. Early grade. From full shoots till a harvest passes on average 117 days. Glory gribovsky 231. Mid-season grade. From full shoots till a harvest of 98 — 126 days. Amager 611. Late-ripening grade. From full shoots till a harvest of 127 — 148 days. It is steady against cracking, it is well transported. Grades for the southern areas Volgogradskaya 45. Late-ripening grade. Very much zharoustoychiva. Gold hectare of 1432. Early, drought-resistant grade. From full shoots till a harvest there pass 102 — 110 days. Cauldron (hybrid). From the southern areas to a midland of Russia. Early grade. From full shoots till a harvest of 106 — 112 days. It is steady against bacterioses and fungal diseases. Likurishka. It is zoned for Uzbekistan. Early grade. The grade is steady both against a drought, and by a heat. Hope. For various warm droughty areas. Mid-season grade. From full shoots till a harvest of 108 — 146 days. Can grow on sandy soil. Does not crack. Grades for northern areas. Wintering of 1474. Late-ripening grade. From full shoots till a harvest of 130 — 151 days. It is frost-resistant, steady against fungal diseases. It is well stored and transported. Early. It is zoned for cultivation in the St. Petersburg, Bryansk, Novgorod regions, in Latvia. Early grade. From full shoots till a harvest of 79 — 120 days. Siberian. Mid-season grade. It is frost-resistant. Red cabbage. Hook. The Srednepozdny grade, can be grown up in many regions since it both is frigostable, and is drought-resistant. From full shoots till a harvest of 110 — 136 days. Mikhnevskaya. Srednepozdny. For Non-Black Earth Region. From full shoots till a harvest of 105 — 120 days. Redma of RZ (hybrid). Srednepozdny. For the southern regions. From full shoots till a harvest of 127 — 148 days. It is steady against a heat. Stone head 447. Srednepozdny. For many areas. From full shoots till a harvest 105 — 135 (to 150) days.